Progressive casino games have opened up bigger jackpots to players whose bankroll does not generally allow them to play for big amounts of money. Now fans of blackjack can play their favourite game in progressive format. Progressive blackjack is not generally offered at land-based casinos but the online iGaming world has embraced the concept and there are plenty of reputable places for online punters to play. These games offer the potential for some big blackjack wins. Note: Following the introduction of the Interactive Gambling Amendment Bill in September 2017, online casinos are banned from offering real money services to Australian residents. The information regarding online blackjack in this article is intended for our international readers only – we do not endorse any blackjack sites for Australian players. How does progressive blackjack work? Every time a player at a progressive blackjack table places a bet, there is a small amount placed into a jackpot pool, like an ante. 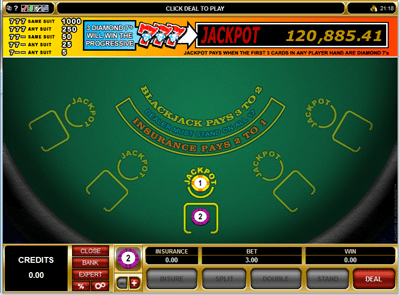 The jackpot generally is a large pot because there are multiple tables contributing to the pool. Every player betting on any individual hand could trigger the jackpot. It follows the same model as the wildly popular progressive pokies, where each time a bet is placed the jackpot rises, with a certain trigger giving the player the ability to win the amount that is indicated on the machine. 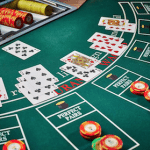 Most progressive blackjack games offer a side bet that does not affect the hand that is being played, but is a direct bet on the progressive jackpot. Much like on a poker machine where three certain symbols or indicators will grant the person the jackpot, blackjack offers a similar premise, only difference being the combination of cards that come out, rather than a symbol. Other popular software programs, like Microgaming offer a similar style of progressive jackpot, only difference being you need to bet on every hand rather than placing a single side bet. Progressive jackpots are a rarity in the world of land based casinos, but they do exist, mainly via slot machines. There are seven several progressive poker games available at Melbourne’s Crown Casino, where the jackpot can top $100k. However the house edge is generally a pretty raw deal for the punter and a huge windfall for brick and mortar casinos. The online world has opened up many new doors and opportunities to play progressive games like Blackjack and Roulette. And the house edge is far better when playing online, so your odds of a life changing progressive win are higher when playing at online blackjack venues. The amount of progressive games online is also far greater and the number of people playing them is also higher, meaning there are big jackpots won daily. For instance, if you are playing a Microgaming progressive jackpot game you won’t just receive the progressive jackpot from the casino you are playing at, you will win the prize from the entire Microgaming network; and for the record there are plenty of online casinos using this platform. 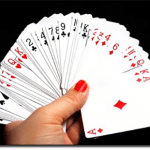 Where can I play progressive blackjack games online? www.RoyalVegas.com – offers progressive Blackjack, slots and Poker. Royal Vegas is at the forefront of modern online gaming, and is your go-to place if you are looking at playing progressive jackpot games because they use the Microgaming network, the largest online gaming platform in the world. So if you love the game of Blackjack, but you are sick of not winning the huge amounts of money you see elsewhere like on poker machines, then progressive Blackjack is your game.